Although Herbert French was a founding member of the Photo-Secessionists in 1902, he worked in relative isolation from his hometown of Cincinnati. In spite of his reluctance to publically exhibit his work, French was included in many Secessionist group exhibitions and was showcased in the July 1909 issue of ‘Camera Work’, alongside an article he had written on creativity. In the introduction to this issue of ‘Camera Work’ French is described by Alfred Stieglitz as ‘a lover and patron of the arts (who) practises photography for no other purpose than the pleasure it gives himself’. He became known for his sombre and ethereal portraits of women who were often portrayed as characters from literature and poetry. His single solo exhibition, held at Gallery 291 in 1906, featured 45 photographic illustrations of Alfred Lord Tennyson’s suite of poems ‘The idylls of the king’, written in 1859. French typically printed his photographs on platinum paper that was capable of articulating subtle tonal shifts. The works in collection of the Art Gallery of NSW are photogravures from his feature in ‘Camera Work’. A mode of mechanical photo engraving, photogravures were photographic reproductions that could be widely printed and disseminated. 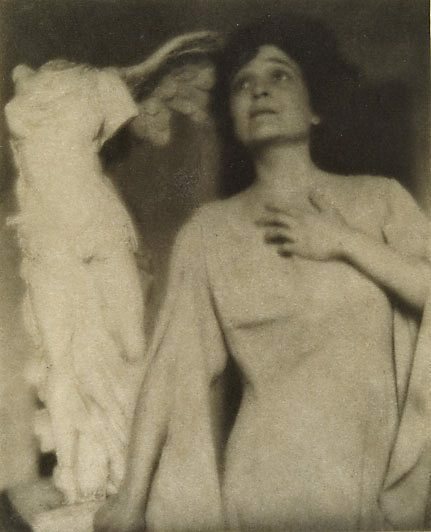 Addressing them in his editorial introduction, Stieglitz noted that ‘it is virtually impossible to do many of his prints justice in reproduction, since Mr French’s work is for the most part exceedingly sensitive and is presented in such a manner that the print is but the part of a scheme’. Even so, these photogravures still convey French’s deft manipulation of tone and his awareness of the emotive potential of the image. His work reflects American pictorialism’s movement away from impressionist style landscapes and the adoption of thematic concerns derived from symbolist art. Endowed with a poetic mysticism, the women in French’s work are dream-like ciphers that obfuscate photography’s connection to reality. Alfred Stieglitz (Editor), Camera Work, no 27 , New York, Jul 1909, (illus. ).